Understanding that families do come in all shapes and sizes, who among us don’t remember hearing some version of it? Being told when Liam was only three weeks old that he’d never reach the developmental level of even a toddler, I never thought we’d have to use that phrase in this house. I knew then that he’d prove them wrong and boy has he, but discipline is one of those “universal” parenting skills that held little importance for us. 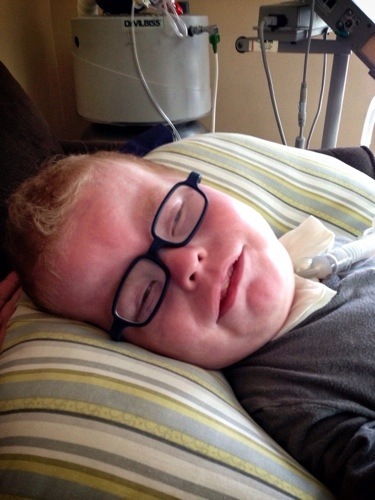 “There are no spoiled kids in intensive care units” people in the NICU and then the PICU say, and for us, once we brought Liam home, it became “there are no spoiled kids on ventilators.” And it worked, for a time. 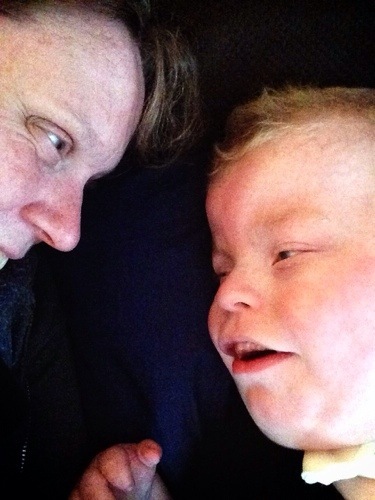 As long as he was breathing, Liam would not hear the word “No” or “now” or the phrase “because I said so” until he was almost four years old. So it’s our own fault really. Don’t let that cute smile fool you. Liam can be just as much the brat that any other five-year old can be. Truth be told, I couldn’t have been prouder to hear that Liam had been pulled from his classroom and into the hallway by his teacher to discuss why he was misbehaving in class. The kid who would never be able to communicate. He almost got a Yellow Card (and we all know you don’t want something like THAT on your pre-kindergarten permanent record). But of course it wasn’t in the fact that he was ignoring his teacher and not participating in his schoolwork but in the how he did just that. 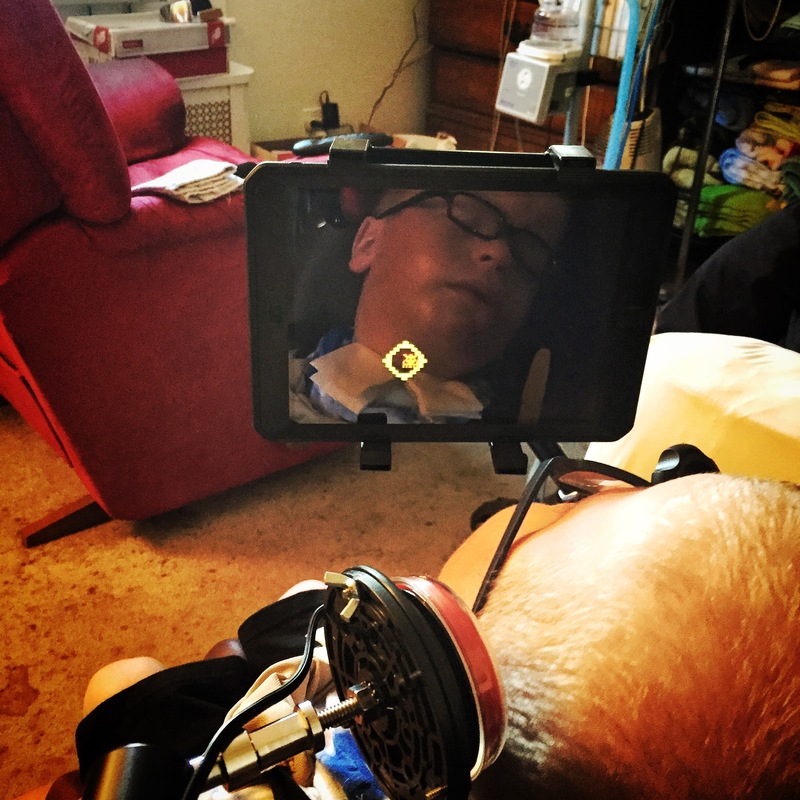 Among Liam’s many super powers is his ability to avoid obligations (dr.’s appointments, physical therapy, occupational therapy, speech therapy, family functions) by sleeping or pretending to be asleep. He hasn’t realized yet that his heart rate monitor betrays his brilliant performances every time. He does it because it works. This time though, Liam decided to push boundaries by actively, alertly, and fully aware of his surroundings and behaviors, refused to make eye contact with his teacher and moving his head around in an effort to NOT look at the activity she was presenting to him. Non-compliant and proud of it, in every way that a non-verbal, low-muscle-toned five-year old brat can be. Let me be clear, Liam loves his teacher. He perks up when she is around and the work that she has been able to do with him has been absolutely staggering. It’s in that love and respect that I think lead Liam to push those boundaries as far as he could. It’s because of her love and respect for him that I think she pulled him out of class to discipline him. Ventilator or no. seizure disorder or no. 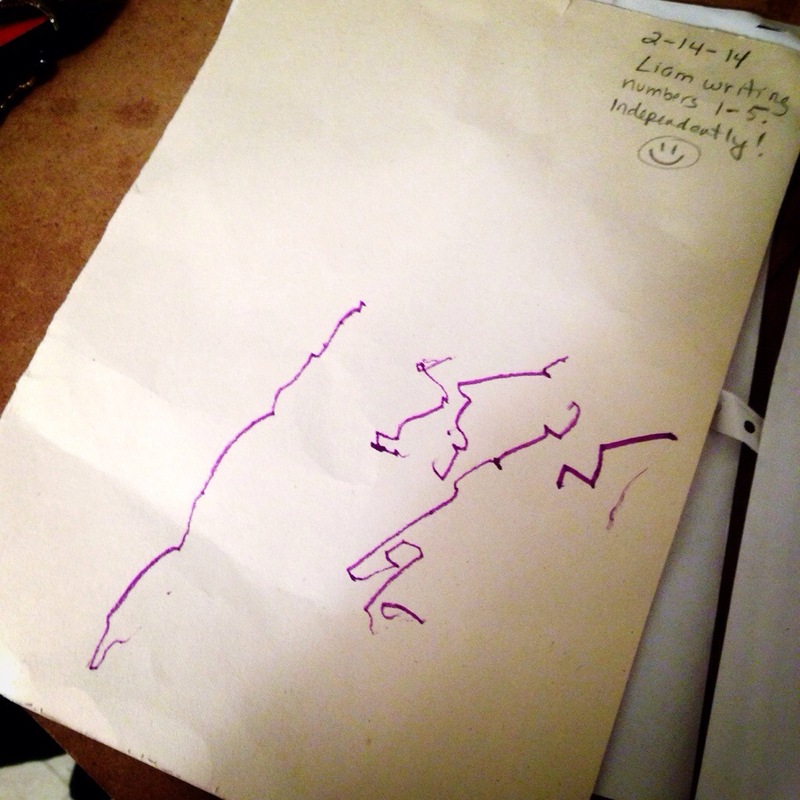 Global developmental delay or no. Liam is held to the same standards of effort and participation as all of her students and if she were to let him slide because he was cute. Or because he has special needs she is doing him no favors. The concept of obligation is a tough one to teach. But it’s a lesson every one of us needs to learn, so when I got the full report from Liam’s mom on my return from work at the end of the day, Liam and I had a nice long talk. A talk about respecting the teachers and the adults in his life. About work, about effort and participation. We talked about what he did wrong, and what he needed to start doing from now on. I didn’t have to work to hard to figure out what to say either. Most of my own “wait until your father comes home” moments came on report card day, where I would get a lecture about work, about effort, and about participation. The next day I was home from work and was able to go with Karin to pick him up from school. His teacher came directly over to us as he and his classmates exited the building. ” Well thank you for whatever you said to him last night. He had an EXCELLENT day today! He worked so hard with me when I asked him to.” she told us. I guess he learned his lesson. Must have been that whole afternoon spent with the guilt and the anticipation of a punishment of some kind. Just waiting for his dad to come home. “Hi Liam, my name is [Sally].” Her name has been changed for privacy’s sake, but each and every one of them came over to introduce themselves to The Boy this morning. It all started with the teacher of course. Miss Paula was finishing up with story time when our tour of what will probably be Liam’s school next september led us into the pre-school I classroom this morning. 9 adorable little kids of wildly varying educational needs that ran the gamut from “typical” to profoundly delayed, lined up after their routine hand sanitizer rub to meet my boy in between story time and a snack of apple slices and cheese. For Liam, this was the most peer age interaction of his life, and for his part enjoyed all of the attention. That was the part that I loved so much, seeing that attention. Not the amount, Liam has always been the star of any room he enters, it was the quality of the attention from these kids. Here in this school, Liam will be the new kid but that’s about all that will make him special. His trach? His vent? Didn’t seem to phase these kids at all. Here in this special place all kids are welcome to join in the class. 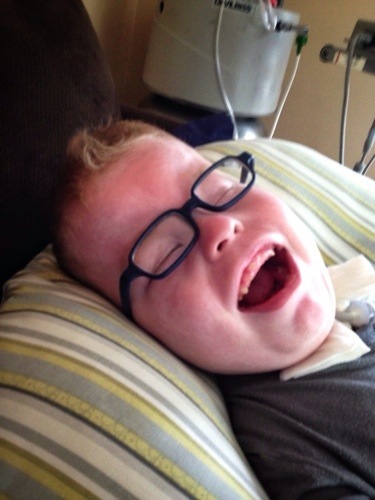 Next month Liam will turn 3 years old and make the transition from Early Intervention to Special Education. All of his therapies will then become the responsibility of our local school department. Although he is required to be registered as a student Karin and I were unwilling to allow him to start school in January. Not during cold, and flu, and RSV season. So we will bring him into a local public school a couple of days a week for therapy until next september at least. There are so many intricacies to any IEP that I am not going to get into the details of Liam’s right now other than to say that the public school Liam would be enrolled in for next year probably won’t be able to accommodate his medical needs making Liam’s safety an integral part in this educational plan. Because of this, the school department will most likely refer us to a private school that is more equipped for Liam’s medical needs and his special education needs. While we were warned that this may be the case, the writing is now on the wall that they are reluctant to take Liam on as a student. After seeing the reports written by our early intervention staff they even decided to bypass all initial testing required for IEP’s. They’re too scared to even set any goals for this first one. What a bunch of Wimps. This morning we toured the school Liam will probably be referred to. I’ll mention it by name someday when Liam’s attendance there is official. It’s like the Disneyworld of schools for kids with special needs. Built in the last ten years it seems as if it were tailor made for Liam. Wide hallways between classrooms. standers, tumble forms, and other adaptive equipment lined up outside each door. Children of different abilities playing in groups together without notice of each others AFO’s, or feeding pumps, kid cart wheelchairs or hearing devices. Kids are able to be kids, not their diagnosis’s. There are times when Karin and I need to find benefits to Liam’s challenges. Some times it’s the only way to make it through. I suppose i could be worrying about Liam’s IEP and how bad it must be that our school department sees him as too complex, but I know my kid. There ain’t any report or piece of paper in the world that will ever change that. I know what Liam is capable of and believe me it’s a whole lot more than anyone who has ever been paid to interact with him has ever given him credit for (and believe me, given his challenges, they give him credit for quite a bit) But that’s where the benefit lies. The control of the situation rest in our hands alone. When people don’t know what to expect from a child all that they can do is defer to the parents if they know what’s good for them. On our way out of the school this morning I didn’t even have to say a word to the school department administrator who accompanied us on the tour. “it’s really an amazing environment I know.” she said as she looked at me defeated. I could see why. After touring the public school that Liam should be attending, no one in their right mind would choose it over this palace. But she has pride in her own school and its program which I admire. Besides, when the school department makes the referral they’re the ones on the hook for tuition. I’m sure the powers that be and the money people would rather we stay in the public school. I’m also fairly certain that she’s not really supposed to encourage even touring this place. “I know you have a great program for what you do, but it’s obvious that your school doesn’t have the equipment or staffing to accommodate Liam. You don’t even have a nurse available every day where this one has at least four on duty nurses all hours of the day. They are used to kids like Liam and he would fit in better here. In the public school he’d be the only kid in a wheelchair never mind the trach and vent. I am sorry but I don’t think we have to think too hard about where Liam should be sent.” I told her. Karin and. Hadn’t yet had time to discuss what we had seen but it was obvious to me that we were On the same page. ” I know.” she said. There was really nothing she could argue about that and we both knew it. It’s still about ten months away but I’ll admit my head is still swimming in all of this education stuff. I guarantee This will not be the last you hear about the process – but at least for tonight I can say that we have found the place where Liam needs to be. My only job now is ensuring that it’s where he ends up.